The East End Available for Pre-Order! Jack Patterson returns to Little Rock at the request of his boyhood friend Sam Pagano, but when Jack arrives, he’s abducted and taken to a remote swamp where he’s beaten and lynched by men set on revenge. Clovis Jones, his friend and bodyguard, finds Jack near death and gets him to a hospital. As Jack recovers, he learns Sam’s college sweetheart, Jana Hall, is now a doctor who established and ran Arkansas’s health clinics for the poor including one in Little Rock’s East End. Jana’s efforts stepped on the toes of some powerful people, including someone who wants her clinics shut down, her medical practice ended, and for her to spend the rest of her life in prison. Meanwhile, someone has killed the men who tried to lynch Jack, and Jack is the prime suspect in the murders. To make matters worse, Jack must defend Jana without the aid of his trusted assistant, Maggie, and his usual co-counsel, Micki Lawrence. Jack faces an unethical special prosecutor, a judge on the take, and the shadowy power broker bent on destroying Dr. Hall and her health clinics. Why Jana has become such a target, no one seems to know. Every time Jack thinks he has caught a break or sees a way to exonerate Dr. Hall, his adversaries or his client put a new obstacle in his path, including a second killer bent on settling an old score. Jack’s courtroom tactics fail, his client wants to plead guilty to protect her patients, and in a last-ditch effort to overcome the long odds against his client he resorts to a complicated and dangerous strategy. The strategy will either save Jana’s life and reputation, or get Jack disbarred, his client put away for life, or worse—get Jack killed. Foreword INDIES Book of the Year Awards Finalist! Who was Harold Spencer? 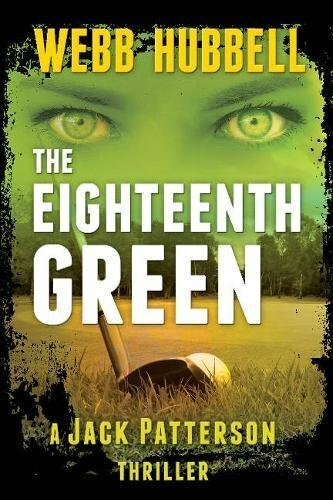 All D.C. Lawyer Jack Patterson knew was that Spencer’s dead body had been found on the 18th Green of Columbia Country Club, cancelling Jack’s Saturday golf game. Who is Rachel Goodman? Her name has been plastered on the front page of every newspaper in the country for weeks, branded as a thief of confidential information vital to U.S. National Security and a spy for Israel. Turns out she is also the daughter of Jack’s long-time friend and mentor, Ben Jennings. Despite the opposition of his friends and clients, Jack feels compelled to defend Rachel. Jack and his team go to work against the Federal Government, the all-powerful military-industrial complex, most of the press and Congress, all of whom are convinced that Rachel is guilty and should receive the death penalty for her treason. Clovis Jones, Jack’s long-time friend and confidante, is the victim of a vicious attack. The more Jack and his team dig, the more complicated and dangerous their work becomes. Even a volunteer group of Navy SEALs may not be enough protection. Who will be next? Named one of Charlotte Observer’s top 5 books for summer! Does trouble follow Jack or does he come looking for it? In Webb Hubbell’s third legal thriller, A Game of Inches (Beaufort Books, June 2016), DC attorney Jack Patterson tackles the NFL, fantasy sports, and the power of information in our nation’s capital. NFL Rookie of the Year, Billy ‘Glide’ Hopper, has been charged with the gruesome murder of a young mystery woman in his locked hotel room at the Mayflower hotel in Washington, DC. Trouble is, Billy has no memory of the events of the night. Drawn in by his friend Judge Marshall Fitzgerald’s unshakable belief in Billy, Jack is determined to establish Billy’s innocence and get to the bottom of the murder. As the mystery deepens, he calls on old friends and colleagues to help him solve the puzzle. They find themselves at war with a powerful and sinister force, and both Jack and those closest to him are literally in the line of fire. In A Game of Inches Hubbell illustrates the role big money, information, and influence have on D.C. politics and how fantasy sports is changing the NFL and the game of football itself. Murder is just the tip of the iceberg. —Steve Spruill, author of Ice Men, Sleeper, and Rulers of Darkness. 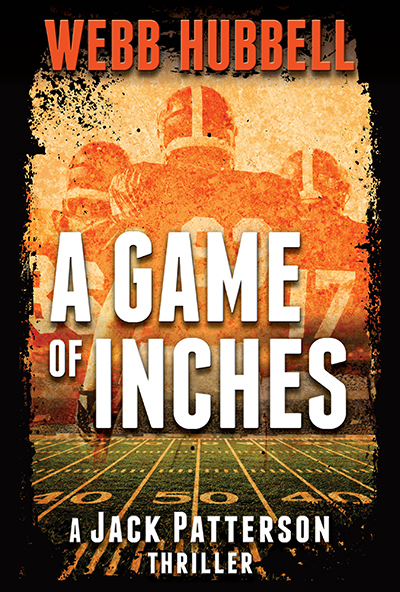 In a plot bursting with danger and complication, “A Game of Inches” spirals to a surprising conclusion. — Harry Thomason, producer of Designing Women and Evening Shade. World-renowned scientist, Doug Stewart, has been thrown in jail by the Feds, and his home and all his belongings have been seized and about to be auctioned. Drawn by curiosity as well as a forgotten promise to his late wife, DC antitrust attorney Jack Patterson returns to Little Rock to learn why Stewart was growing hundreds of marijuana plants in his back yard. Jack enlists security expert Clovis Jones and local lawyer Micki Lawrence in a race against time to uncover why the Feds are refusing to allow Jack see his client, why someone will stop at nothing, including murder, to prevent him from investigating the case, and why Stewart’s wife, Liz, continues to insist its all about her not-so-secret – Ginger Snaps. 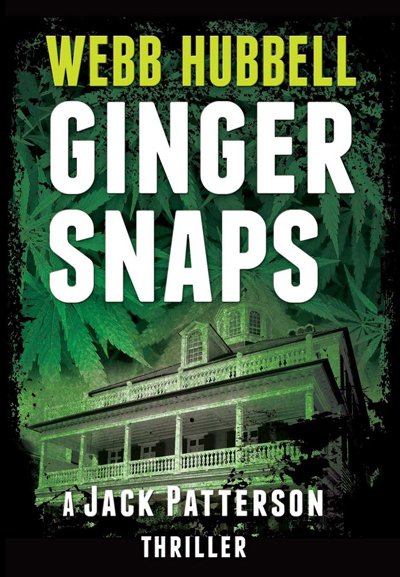 The Charlotte Observer’s acclaimed Book Reviewer, Dannye Romine Powell, reviewed Webb Hubbell’s latest thriller Ginger Snaps in Sunday June the 5th’s Entertainment section. “Move over, John Grisham, the legal thriller has a new master! Webb Hubbell delivers another dynamite legal thriller starring the engaging Jack Patterson. I loved “Ginger Snaps.” Hubbell brings alive the contemporary south as only one who has lived it can do. The novel has everything—a modest but brilliant hero, lots of romance, a plot with ceaseless, breath-taking twists, characters who jump off the page and a topic destined for tomorrow’s headlines. Treat yourself to Ginger Snaps! — Steven Spruill, Author of Before I Wake and My Soul to Take, both were featured in Literary Guild and Doubleday Book Club and condensed in Good Housekeeping Magazine. “I don’t know how Webb Hubbell learned to write, but I sure know he did. He fashions masterful, stories of intrigue and human cupidity that hook me from page one. Ginger Snaps is the second Jack Patterson novel I’ve read and I’m committed to whatever other adventures of Jack’s leak out of Webb’s pen. His characters are human enough to make me love them, and just smarter enough than I am to make me stick with them and see how it all turns out. Put me down as first in line for the next one, Webb. Webb Hubbell, award-winning author of When Men Betray and Ginger Snaps, is a nationally recognized author, lecturer, and speaker on government, business and leadership. He has held executive level positions in government and industry including: U.S. Associate Attorney General, Chief Justice of the Arkansas Supreme Court, Mayor of Little Rock Arkansas, Managing Partner of the second largest law firm in Arkansas, and Executive and Chief Counsel for a large Washington based Commercial Insurance Company. Why would Woody Cole, a peaceful, caring man, shoot a U.S. senator in cold blood on live television? That’s the mystery facing attorney Jack Patterson as he returns to Little Rock, Arkansas, a town he swore he would never set foot in again. Jack is supported by a motley but able crew, including loyal assistant Maggie, college-aged daughter Beth, feisty lawyer Micki, and his bodyguard Clovis. Together, Jack and his team are in a race against time to discover Woody’s hidden motive. All he has is a series of strange clues, hired thugs gunning for him, and the one man who knows everything is not talking. Alliances are tested, buried tensions surface, and painful memories are relived as he tries to clear the name of his old college friend. Jack Patterson will find that even the oldest friendships can be quickly destroyed when men betray. —Anne Harding Woodworth, author of The Artemis Sonnets, Etc. I’d bet money we’ll be seeing a movie of this. Hope so. This was so good I just want more. You had me captured from start to finish. Thank you so much, Webb. This has been a wonderful escape. I spent the weekend with your new book. I thought it was excellent. Great, entertaining characters, captivating plot, and an ending that just keeps giving. I think it will be a real winner. Plenty of room for a number of sequels. I got so interested in it that I drove by Lamar Porter Field this morning on the way to work for a little dose of nostalgia. I even re-read a few parts of it. I certainly believe it equals and exceeds anything available in legal fiction. — Mike Edwards, Author of more than 55 articles for Nat’l Geographic. 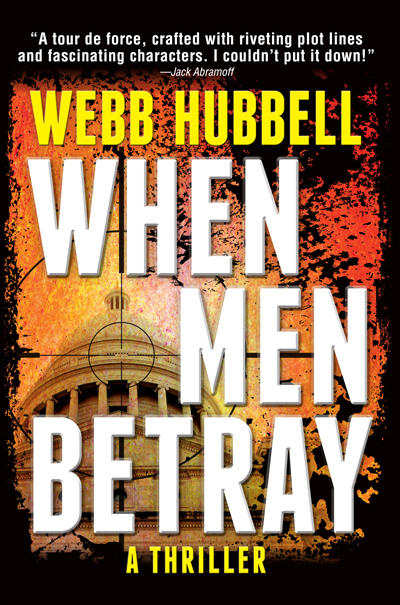 When Men Betray is the first novel in a series from award-winning author, lecturer, and advocate Webb Hubbell. Set in a fictionalized version of his hometown of Little Rock, Ark., readers will be immersed into the steamy world behind southern garden parties and polite facades—a seedy underbelly of secrets, betrayals, and the possibility of redemption. Clever readers may recognize the colorful personalities and locales of the Arkansas political scene. Set in Hubbell’s hometown of Little Rock, Ark., this legal thriller tests friendship, family, and race relations while delving deeply—indeed cynically—into the behavior of politicians, lawyers, judges, and the accused. As former mayor of Little Rock, Chief Justice of the Arkansas Supreme Court, and Associate Attorney General of the United States appointed by former President Bill Clinton, Webb Hubbell is an expert in the intricacies of the U.S. government and our criminal justice system. He has firsthand experience on both sides of the bench and brings his unique knowledge and experience to every page. 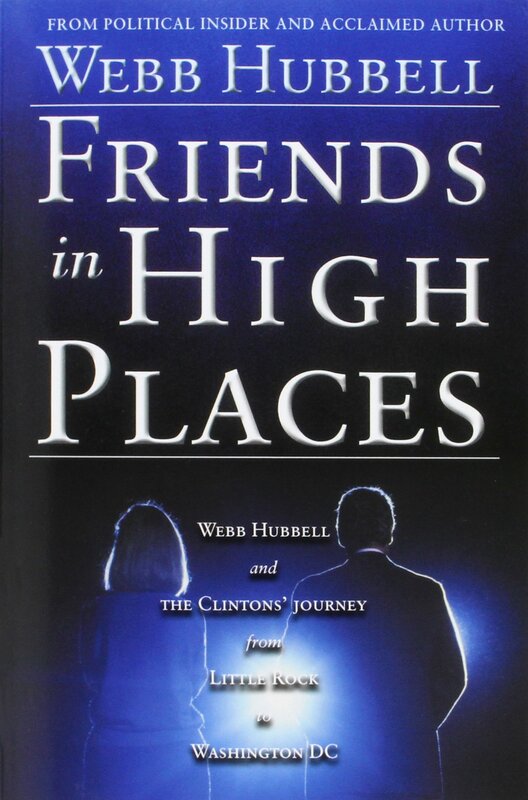 In 1997 Webb Hubbell’s autobiography, Friends in High Places, was published. His current publisher, Beaufort Books, recognized its importance to the political discussion going on right now and has decided to make sure it is available to a much broader audience by way of e-books and paperback. It offers a different picture of Hillary Clinton than is being offered by the media these days. Before the nation came to know them as the President and First Lady, Bill Clinton and Hillary Rodham were close friends of Webb Hubbell’s. Hubbell offers insight into how he and the Clintons climbed the political ranks from Arkansas to the White House. Included in this book are intricate tales of Hubbell’s support of Bill Clinton in his tensest moments; his friendship with Hillary Rodham Clinton; the tragic death of Vince Foster; details of involvement in Whitewater; an inside look at the Justice Department and partnership with Janet Reno; and insights into famous personalities such as Mac McLarty, Bernie Nussbaum, Bruce Lindsey, Mickey Kantor, and George Stephanopoulos. Hubbell’s story is told from the perspective of one who personally knows the President and First Lady. Their friendship began when Hubbell and Hilary Rodham Clinton were partners at Little Rock’s Rose Law Firm; and when Bill Clinton worked as Governor of Arkansas, Hubbell served with him as Mayor of Little Rock, and later as chief justice of the Arkansas Supreme Court. Hubbell joined the Clintons in the White House as associate attorney general, the third highest ranking member of the Justice Department. His political career ended, however, with the Whitewater scandal and incarceration in federal prison. Hubbell comments on his resignation and prison sentence, and reflects on his old friends whom have since isolated him from the White House. The journey is Webb Hubbell’s, yet his recounting resonates with the humanity in us all: the love he shares with his wife and family, the grief over losing friends to death or circumstances, and humility when faced with calamity. In the end Hubbell faces the truth with a steadfastness seldom seen in Washington. This new edition includes a new introduction and epilogue.